Reclining airplane seats are a terrible idea and should be banned. 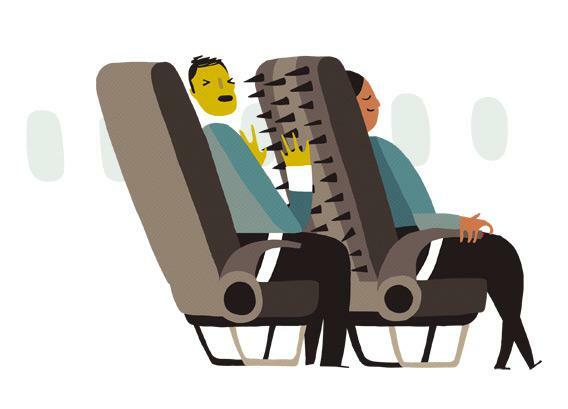 Tilting your seat back on an airplane is pure evil. But so is installing seats that recline in the first place. For the five minutes after takeoff, every passenger on an airliner exists in a state of nature. Everyone is equally as uncomfortable as everyone else—well, at least everyone who doesn’t have the advantage of first class seating or the disadvantage of being over 6 feet tall. The passengers are blank slates, subjects of an experiment in morality which begins the moment the seat-belt light turns off. Or else there are those, like me, who refuse to be so rude as to inconvenience the passengers behind us. Here I sit, fuming, all the way from IAD to LAX, the deceptively nice-seeming schoolteacher’s seat back so close to my chin that to watch TV I must nearly cross my eyes. To type on this laptop while still fully opening the screen requires me to jam the laptop’s edge into my stomach. “No!” she snapped. “We paid for these goddamn seats, and we’ll recline them if we want to.” So then everyone was angry: I was angry because I had no room, and she was angry because I passive-aggressively kicked her seat once every 15 minutes—often enough to be annoying, but not often enough to definitely be on purpose. Reclining seats have been with us as long as airlines began making human passengers a priority. In the 1920s and 1930s, people were an afterthought; planes were meant to carry airmail and cargo, and any humans who wanted to come along were welcome to pay an astronomical fare and sit in wicker chairs. “Reclining seats were not a universal treatment until the DC-3 era,” beginning in 1935, says John Hill, assistant director in charge of aviation at the SFO Museum. In the beginning, reclining seats—along with footrests and in-seat ashtrays—were designed as part of airlines’ commitment to deluxe accommodations, as captains of industry in three-piece suits sipped martinis on board, stretching their legs one way and tilting their seats the other. That’s why the woman in front of me does not really deserve my hatred. (Although would it kill her to straighten her seat back even a little when she goes to the bathroom?) Miss Manners agrees: The real offending party is the airline—in this case, Virgin America. They installed stylish purple lighting and sleek leatheresque seats in this A320 jet; they serve much better food than you might expect; even their in-flight safety video is endearingly written and animated. And the seats on Virgin (and every airline, really) are a marvel: “One of the most highly tuned man-made environments, period,” Hill notes, “optimized for space and weight and safety.” But despite all these nods toward modern, customer-friendly design, Virgin still, in opposition to all that is right and good, installs reclining seats on their planes. Just like everyone else. Some European airlines have begun installing seats that are slightly tilted in their natural resting state, which, anecdotally at least, helps convince passengers they don’t need to tilt further. But that doesn’t go far enough. It’s time for an outright ban on reclining seats on airplanes. I’m not demanding that airlines rip out the old seats and install new ones; let’s just extend the requirement that seats remain upright during takeoff and landing through the entire flight. (Unlike the stupid electronic-devices rules, there is an actual good reason for this regulation: Upright seats are safer in a crash, and allow for easier evacuation.) To those who say such a rule is unenforceable, I respond: Kick. Kick. Kick. Of course, this whole debate has a limited shelf life. Ten years from now, if financially strapped American carriers exist at all, they’ll surely have gone the way of budget European airline Ryanair, with its nonreclining seats—and horrifying 30-inch seat pitch. When I fly in one of those planes of the future, will I be comfortable? Absolutely not. But I won’t complain, because at least everyone else will be exactly as uncomfortable as me.